Did you know that the hiring manager only spends around 8.8 seconds on average reading a CV? It may be hard to believe but not a lot of time is spent reading each CV due to the sheer number an employer may receive. They want to quickly skim read and check that the CV offers the skills and qualifications they’ve requested on the job advert, so in order to make an instant impression everything has to be on the money. The way your CV is presented has a huge impact on your chances of getting an interview. Someone with the perfect skills and qualifications would still struggle to get an interview if their CV was poorly structured and difficult to navigate. Remember to clearly indicate each section with a heading, and to space those sections out correctly so the reader can easily find what they are looking for. 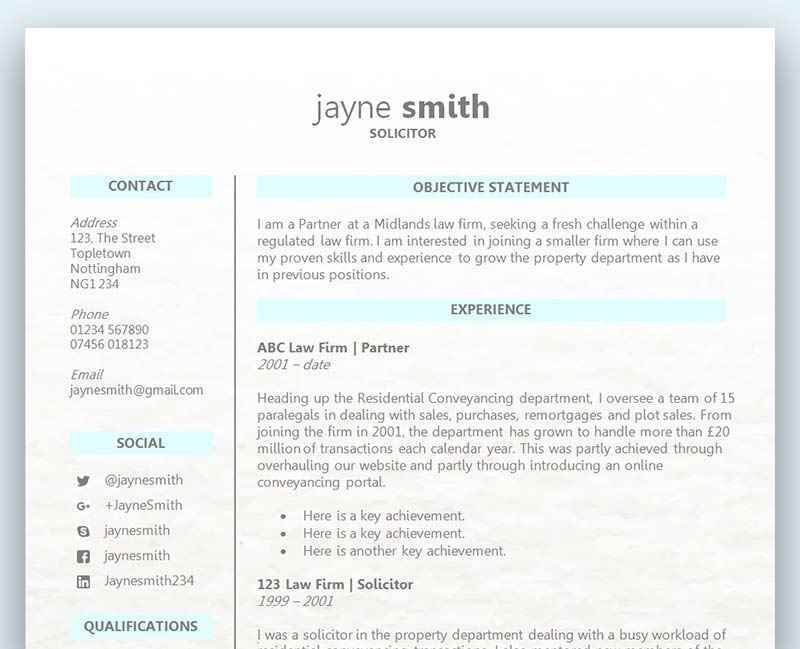 A great way to ensure your CV looks the business is to use a ready made CV template. All you have to do is insert your details as the layout has already been done for you. Above: Some of our free professionally designed CV templates. Left: Accountant CV template; Middle: Secretary CV template; Right: Business Development CV template. Remember, for most of our templates, the name refers to the sample content only – you can customise these CV layouts to suit any role. A common mistake to make when writing a CV is to disregard a lot of important information and only focus upon the job title. Although you may have experience in that particular role, every company is different and it’s important to ensure you fulfil the requirements before you apply. Before you write your CV for the role you should highlight all the relevant skills and qualifications that have been requested on the advert and begin to look back over your work history to see if you can pick out anything that matches these requests. Understanding what the company wants from an employee is a vital step of the CV writing process. An employer is looking for someone who has industry knowledge and will use the right jargon within their CV to prove this. The standard size of a CV should be two pages long, but there are some exceptions. A recent graduate may use just the one page, as they have little work experience and would typically be applying for an entry level position. A graduate however would still be recommended to stretch to two pages if possible using extracurricular activities and voluntary/part time work as points of interest and experience. Most professionals in the middle of their career should go with two pages, as this is more than enough to include everything relevant to the employer. A three page CV is often reserved for certain careers like medical and science, and would apply to someone with an extensive amount of work experience, qualifications, accolades and achievements. Now that you’ve read and understood the job advert and what the employer expects to see on a CV, you are now in a great position to write a CV that is tailored to the role and the company. Look to only include the most recent and relevant information so that the hiring manager has an easy job of seeing that you are the right person for the job. Only a tailored CV can have this kind of impact and make the employer notice you in an instant. You only get one chance and possibly about 8 or 9 seconds to make that all important first impression – so make it count. Give the employer exactly what they’re looking for and don’t hide information within mountains of waffle. Keep your CV on topic, focused and tailored to the role, brief and to the point! A soft skill is a generic skill that we all have in some capacity like communication, organisation, working well under pressure, and so on. A specific skill will have been requested on the job advert and could be anything from being able to use certain computer software to holding a licence to drive a fork lift truck. Your CV needs to match these skills and clearly demonstrate that you have the experience and qualifications the role requires. If you hold the correct driving licence which is a mandatory requirement, then highlight this information near the top of the first page so that employer can easily see that you are an instant potential candidate. Soft skills are harder to identify from the job advert as they are not always stated and can sometimes be hidden within the context of the description. Look deeper into the role and conclude what would be the most important soft skills to have, and then search through your own work history to locate previous roles that you can showcase those skills. Provide examples of your performance and don’t be afraid to include any numbers and statistics to help back your claims. The employer wants to see that you have the right soft skills, not just by you saying you have them, but by proving you do. Still not sure about the difference between hard skills and soft skills? Try this short video from GCF Global. When it comes to writing your employment history you need to be careful not to include too much irrelevant information. If you have an extensive amount of experience it will be highly unlikely that every single role will need to be explained in detail with a huge list of tasks and responsibilities. Instead, you should focus on detailing the most recent and relevant roles so that the employer can quickly see that your experience will benefit them. Keeping things relevant does not just apply to your work history, and it applies to the whole of your CV. The hiring manager wants to spend as little time as possible short listing for interviews, so making it hard work for them is a bad idea. It won’t matter how qualified you are for the role if the employer isn’t able to identify the information they are looking for. The hobbies and interests section should not be underestimated, and this would be another opportunity to demonstrate your soft skills. Being part of a sports team, writing for the university newspaper, coach of your local swimming team, or volunteering for your local country park – all of these are great examples of showcasing soft skills. Stay clear of the boring and mundane hobbies like watching TV and socialising with friends. These types of hobbies don’t add any value to your CV, so in most cases it would be better to leave them off. The kind of hobbies which would add value to your CV are creative, sporty, involve teamwork, and involve organisation. You may find our article ‘Does the hobbies & interests section of my CV matter?‘ helpful. Choose a manager for your main reference, who has knowledge of your work – and speak to them first. Choose a set of references from managers that you have worked closely with and who are happy to provide one. It’s always a good idea to contact your references before you put them down on your CV to ensure they are happy to provide one and are aware of what they might be asked. If you’re applying for a job whilst still working at another company, you may not want to give over your reference details until you have a job offer in hand. If you don’t have any work experience, then consider choosing a couple of teachers as a reference. Again, speak with them first to check they are happy to provide one and let them know what role you are looking to pursue. You may find our article ‘Choosing the right CV references – what to include‘ helpful. Don’t forget to update your CV when you develop a new skill, get promoted, gain a new qualification, change roles, or take on more responsibility. If you don’t update your CV shortly after the event you may forget, which means your hard work and progression is never going to see the light of day. Although you might feel grounded and happy at your current place of work, you never know if there is a sudden change of circumstance just waiting around the corner. This could be in the form of redundancy, internal issues, or your own personal situation. Keeping your CV up to date is a very smart thing to do, and you should never assume that you won’t need it again. The format of the CV is developing rapidly each year with fresh and modern CV templates emerging constantly. No longer happy with the plain old black and white CV, employers are looking for every application to go that one step further each time.